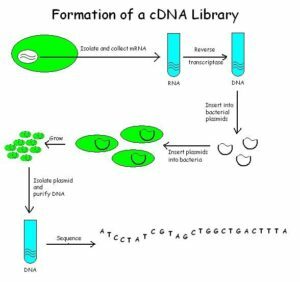 A DNA library is a collection of DNA fragments that were cloned in vectors for scientist to easily be able to identify and isolate desired fragments for genetic studies. Two kinds of DNA libraries are constructed. There are genomic DNA libraries which contain a representation of an organism’s entire genome. The number of clones produced in a genomic library will depend on the size of the genome being studied and the size of genes that a cloning vector system can tolerate. Application of genomic libraries include complete genome sequencing for organisms, source of genome in the production of transgenic animals, and studies on the function of regulatory sequences and genetic mutation in cancer cells. Another type of library is the cDNA library which is a collection of cloned complementary DNA fragments inserted into a host cell, which combines with some portions of the transcriptome of the organism to be stored as a library. It is produced from fully transcribed mRNA found in the nucleus and so only contain copies for coding sequences. Using cDNA libraries, bacterial cells can express eukaryotic genes. Applications of cDNA libraries include cloning of full-length cDNA molecules in vitro, discovery of novel genes, studies on alternative gene splicing in different cells and tissues, and studies on the variety of mRNAs expressed by different cells and tissues. DNA libraries make it easier to access gene of interest. However, with the variety of DNA fragments included in certain libraries, several techniques were developed to easily isolate and identify these genes of interest from the libraries. The nitrocellulose containing the bound DNA will then be exposed to a hybridization probe containing a single DNA fragment with a specific sequence that can determine the presence of the target DNA. It employs the use of a radioactive labeled atom or molecule tags using fluorescent or chromogenic dyes. Other blotting techniques are the northern blot and the western blot methods. Northern blot method is used to detect isolated mRNA in a sample while Western Blot Method is used to detect proteins using antibodies. Probes for northern blotting are composed of nucleic acids with sequences complementary to all or part of the RNA of interest. Just like the fingerprint, the DNA of an individual is said to be unique. This means there is no two individuals with the same genetic code. This is why this technique is commonly used in forensic investigation to identify criminals who have left some body fluids which can be sources of DNA. 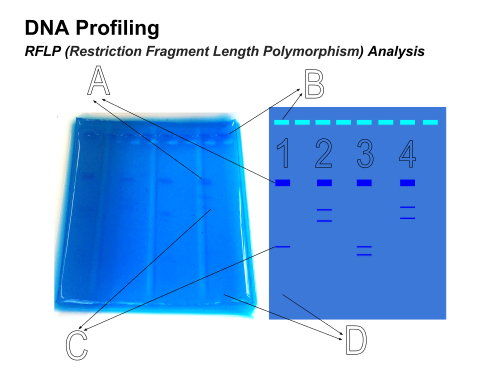 One of the most common DNA fingerprinting technique is the Restriction Fragment Length Polymorphism (RFLP). This technique employs the use of special enzymes to cut segments of a sample where DNA can be extracted. The technique involves looking for repetitive DNA base sequences in the individual DNA using specific restriction endonucleases. It specifically looks for the difference in the homologous DNA sequences. RFLP markers are highly locus-specific; that is why this can be used to detect genetic diseases. An RFLP probe is a labeled DNA sequence that can hybridize with one or more fragments of the DNA sample. When they are separated using electrophoresis technique, different viewing techniques may be used such as use of UV light, or autoradiography in case of use of radioactive markers. When a mutation occurs, there will be changes in the profile of the normal and mutated DNA fragments obtained after electrophoresis. Another technique used in DNA fingerprinting is Short Tandem Repeats Polymorphisms (STR). STR are short DNA sequences that are repeated a dozen or more times in a head to tail manner. The technique does not involve using restriction enzymes like the ones used in RFLPS. 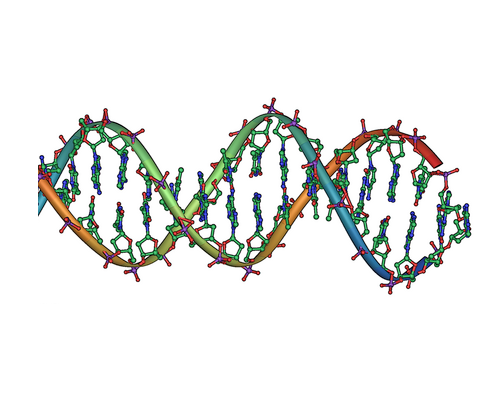 The technique employs the use of probes that attach to a specific region in the DNA. Polymerase Chain Reaction is then done to determine the length of the short tandem repeats. STR regions are variable or polymorphic that is why it can be used to discriminate one DNA profile from another. One individual can have 5 repeats of a specific sequence while another have 7. The number of repeats can be used to profile individuals. Biotechnology finds a variety of applications in the field of medicine. One common example of this is in the production of insulin. Human insulin is important for the control of blood sugar levels. Patients with Diabetes mellitus cannot produce their own insulin and so have difficulty regulating their sugar levels. Genetic engineering paved the way for the production of synthetic insulin. Part of this process is to extract the gene responsible for the production of insulin and insert it in a plasmid vector to form the recombinant DNA with human-insulin producing gene. The recombinant DNA is then introduced to a bacterial cell. When the gene to produce insulin is expressed by the recombinant bacterium, insulin will be extracted, purified and bottled. This will then be injected to patients as supplements. Same procedure is done in the production of human growth hormone Protropin. Other application of recombinant DNA technology is in the production of vaccines. Recombivax HB is an approved Hepatitis B vaccine developed using rDNA technology. The vaccine was produced by isolating HB antigen producing gene from the HB virus. The gene is then inserted to the plasmid DNA of a bacterium to form the rDNA. The rDNA is then introduced to a yeast cell which multiplies and when fermented, produces the HB antigens. The HB antigens are then extracted, purified and bottled and will then be injected as vaccines. Gene therapy is another application of biotechnology in Medicine. Gene therapy involves injecting nucleic acid polymers into a patient’s cell to treat diseases. A common approach in gene therapy is to extract stem cells from the patient first. A working copy of the gene is then inserted into a virus. The virus will then insert the working gene to the extracted stem cells. When the stem cells will be returned back to the patient, the patient will be able to express the working gene. This can best be coupled through the CRSPR/Cas9 System which allows better targeting of genes. Biopharming is an interesting application of biotechnology in the field of agriculture. Through this technique, plant species can be used to produce pharmaceutical products. 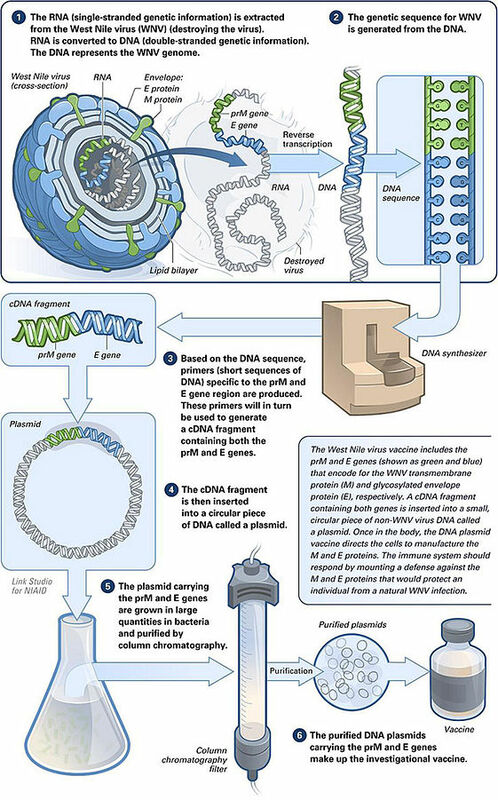 Same general process is done in the production of rDNA. Plant cells will be modified by inserting genes responsible for the production of certain pharmaceutical compounds. When the plant cells are grown, they will express the gene inserted and produce compounds they do not normally produce. The plant materials can later be collected and extracted to obtain the pharmaceutical compound of interest. The extracts are then processed to produce the drugs to be sold in the market. Herbicide and pest resistant plants were also developed using rDNA technology. A common example of which is the BT corn. BT stands for Bacillus thuringiensis. This bacteria naturally produce proteins that kill Lepidoptera larvae. The gene responsible for the production of this protein is inserted to corn cells so that it is also able to produce the same protein which will serve as its protection from the corn borer larvaes. What is good about the protein produced is that it is highly selective as it can only kill Lepidoptera larvae. This means BT corn are safe to be eaten by humans. Transgenic animals are animals that carry foreign genes inserted into their genome. This is achieved via the same process as in common rDNA applications. Some complexity is involved because this technique involves eukaryotic animals. One common example of a transgenic animal is the GloFish which is transgenic zebrafish. The gene inserted in the genome of the animal is responsible for the production green fluorescent proteins. 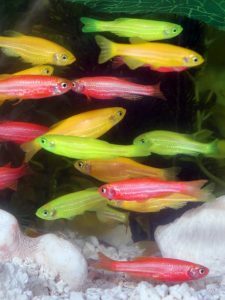 Differences in how combinations occur during transformation result in production also of fish that produces fluorescent yellow and fluorescent red. 1. What do you call the technique that uses restriction endonucleases to cut DNA samples at specific sites and when coupled with electrophoresis technique and autoradiography, can discriminate one individual from another? 2. Which blotting method uses antibodies to detect proteins?